Korean fried chicken or KFC, usually called chikin (치킨, from the English "chicken") in Korea, refers to a variety of fried chicken dishes from South Korea, including the basic huraideu-chikin (후라이드 치킨, from the English "fried chicken") and spicy yangnyeom-chikin (양념 치킨, "seasoned chicken"). In South Korea, fried chicken is consumed as a meal, an appetizer, anju (food that is served and eaten with drinks), or as an after-meal snack. 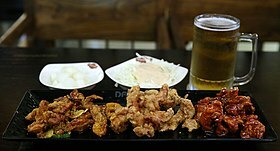 Ganjang-chikin (coated with soy sauce), huraideu-chikin (regular fried chicken), and yangnyeom-chikin (coated with spicy sauce) with a glass of beer. Korean fried chicken differs from typical American fried chicken because it is fried twice; the skin is therefore crunchier and less greasy. Furthermore, Korean-style chicken is not characterized by the crags and crusty nubs associated with American fried chicken; it was described by Julia Moskin of The New York Times as a "thin, crackly and almost transparent crust". The chicken is usually seasoned with spices, sugar, and salt, prior to and after being fried. Korean fried chicken restaurants commonly use small- or medium-sized chickens; these younger chickens result in more tender meat. After frying, the chicken is usually hand-painted with sauce using a brush in order to evenly coat the chicken with a thin layer. Pickled radishes, beer, and soju are often served with Korean fried chicken. The Korean word chikin (치킨) refers to fried chicken (and occasionally also to roasted chicken), while the name for the domesticated fowl is dak (닭). The word is shortened from peuraideu chikin (프라이드 치킨), which is a transliteration of the English phrase "fried chicken". According to the National Institute of Korean Language, the word chikin (치킨) refers to "a dish made by coating chopped chicken with flour, and frying or baking it". Fried chickens that are not chopped before frying are called tongdak (통닭, "whole chicken"). Both chikin and tongdak are occasionally referred to as dak-twigim (닭튀김, "chicken fritter"). The unshortened form peuraideu chikin, despite being the "correct" transliteration, is not as popular in Korea. The more commonly used form, huraideu-chikin (후라이드 치킨), may have been adopted in Korean owing to residual influence from the Japanese convention that persisted in Korea in the 1970s (the Japanese forced occupation only ended in 1945). The phrase huraideu-chikin is often shortened to huraideu (후라이드) and refers to a fried chicken dish without the added seasonings post-frying. This is often used to differentiate it from yangnyeom-chikin (양념 치킨, "seasoned chicken"). The National Institute of Korean Language does not recognize huraideu-chikin as the conventional name, but insists on the transliteration (and transvocalization) peuraideu-chikin, which it also insists should be "refined" to dakgogi-twigim (닭고기 튀김, "chicken meat fritter"). The concept of frying chicken in Korea has its beginning during the Korean War, when American troops stationed in South Korea during the late-1940s, and the early-1950s. Traditionally, Koreans steamed chicken for consumption, and chicken dishes usually came in soups and broth. This all changed however, when Americans began placing stalls selling soul-food American fried chicken, focusing on the four areas of Seoul, Busan, Pyeongtaek and Songtan. The modern trend of eating chicken began in Korea during the late 1960s, when Myeongdong Yeongyang Center in Seoul began selling whole chicken roasted over an electric oven. The first Korean fried chicken franchise, Lims Chicken, was established in 1977 in the basement of Shinsegae Department Store, Chungmu-ro, Seoul  by Yu Seok-ho. Yu stated that his idea of selling smaller, individual pieces of fried chicken in Korea came along in 1975 when he went to go study abroad in the United States. He began frying chicken there, and received accolades for creating 'ginseng chicken'. He started his business in Korea with six pieces of fried chicken between ￦280 to ￦330, and sold around 900 pieces as his beginning career. The well-known variety with spicy coatings, also known as yangnyeom-chikin, had its history begin in 1982 by Yang Hee-Kwon, who was running Pelicana Chicken at Daejeon. He noticed that customers in his restaurant were struggling to chew on the hard, crisp layers of the fried chicken, and led to inconveniences such as scraped palates. Yang decided to pull a twist on the traditional fried chicken to soften the hard shells of the chicken, and appease more Korean customers by marinating it sweet, and spicy. Yang states that despite the spicy flavor, the very first yangnyeom-chikin did not include gochujang as one of their marinating ingredients. In recent years, owing to market saturation in Korea, many of Korea's major fried chicken chains, such as Mexicana Chicken, Genesis BBQ, Kyochon Chicken and Pelicana Chicken, have expanded to set up new presences in the United States, China, Canada, and Southeast Asia. Huraideu-chikin (후라이드 치킨, "fried chicken") – often simply referred to as huraideu (후라이드), this is the basic fried chicken. Yangnyeom-chikin (양념 치킨, "seasoned chicken") – also known in the West as yangnyeom-tongdak (양념 통닭, "seasoned whole chicken") despite not being tongdak, and also sometimes used as a synonym for "Korean fried chicken" by Western media, this is fried chicken coated in gochujang-based sweet and spicy sauce. Banban (반반, "half-half") – shortened from yangnyeom ban, huraideu ban (양념 반, 후라이드 반, "half yangnyeom, half huraideu") is often used to refer to chicken that is served half seasoned and half plain. Ganjang-chikin (간장 치킨, "soy sauce chicken") – fried chicken coated in ganjang-based sweet and savoury sauce, which is often also garlicky. Padak (파닭, "scallion chicken") – fried chicken topped with or smothered with a large amount of thinly shredded scallions. Tongdak (통닭, "whole chicken") – also called yennal-tongdak (옛날통닭, "old-time whole chicken"), this is a 1970s-style whole chicken deep-fried in oil. Sunsal-chikin (순살 치킨, "pure flesh chicken") – boneless chicken. ^ Erskine, Gizzi (2015-11-11). "My Guilty Pleasure: Gizzi Erskine's 'KFC' (Korean fried chicken)". The Irish Times. Retrieved 2017-02-15. ^ Reinhart, Brian (2016-08-22). "Six Essential Korean Fried Chicken Spots in Dallas, Ranked". Dallas Observer. Retrieved 2017-02-15. ^ Chamberlain, Chris (2016-02-01). "Finally, Nashville is Getting the Best Kind of KFC: Korean Fried Chicken". Nashville Scene. Retrieved 2017-02-15. ^ a b c d e Kim, Violet (2015-06-22). "Watch your wing, KFC! Korean fried chicken (and beer) is here". CNN. Retrieved 2017-02-10. ^ a b Moskin, Julia (February 7, 2007). "Koreans Share Their Secret for Chicken With a Crunch". The New York Times. Retrieved March 4, 2013. ^ (in Korean) 전, 경하 (2017-02-06). "[우리 식생활 바꾼 음식 이야기] 기름·닭·소스 388가지 맛 '치킨 공화국' …20년간 외식 메뉴 1위". Seoul Shinmun. Retrieved 2017-02-11. ^ (in Korean) "치킨 (chicken)". Standard Korean Language Dictionary. National Institute of Korean Language. Retrieved 2017-02-11. ^ "치킨 (chicken)". Basic Korean Dictionary. National Institute of Korean Language. Retrieved 2017-02-11. ^ (in Korean) "닭-튀김". Standard Korean Language Dictionary. National Institute of Korean Language. Retrieved 2017-02-11. ^ a b "프라이드치킨 (fried chicken)". National Institute of Korean Language. Retrieved 2017-02-11. ^ a b c "우리나라 치킨의 유래와 역사 - 치킨이 지배하는 나라, 한국". 이과의 읽을거리. KBS2. Retrieved 5 June 2015. ^ a b c "History of Korean-style fried chicken". The Korea Herald. ^ "First Fried Chicken Franchiser in Korea, Lims Chicken". AgraFood. ^ "Chicken 'hallyu' in offing". The Korea Times. ^ Ozersky, Josh (2013-08-30). "Why We Can't Get Enough Fried Chicken". Wall Street Journal. Retrieved 2017-02-11. ^ Trinh, Jean (2016-06-13). "Here's Your New Go-To Spot for Crispy Korean Chicken Wings". Los Angeles Magazine. Retrieved 2017-02-11. ^ Berning, Dale (2017-01-07). "Reiko Hashimoto: 'I never buy anything ready-made – not even sandwiches'". The Guardian. Retrieved 2017-02-11. ^ "Seven Singapore places to get your fried chicken fix". Malay Mail. 2016-04-09. Retrieved 2017-02-11. ^ Garcia, Joseph L. (2016-12-08). "The many flavors of Korean fried chicken". BusinessWorld. Retrieved 2017-02-11. ^ (in Korean) 김, 오희 (2016-08-25). "[스마트 리빙] 추억의 그 맛, '옛날 통닭' 外". MBC News Today. Retrieved 2017-02-10.